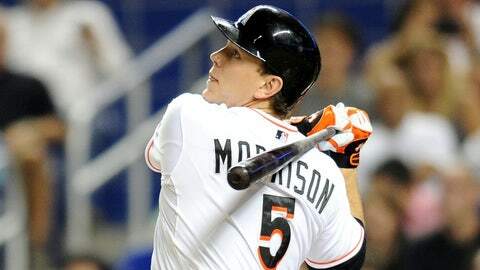 Injuries limited first baseman Logan Morrison to 178 over the past two seasons with the Marlins. "We decided we were going to go in a different direction, and we wanted to try and identify areas we could upgrade our offense," Hill said via teleconference Friday. "It was decided we would try to do so at the first base position." "We really haven’t seen productive LoMo since the 2011 season," Hill said. "I think ultimately we felt as a group that we needed to upgrade." "That six homers and 36 RBI just wasn’t going to get us where we wanted to go, and we felt in Garrett Jones — a proven, consistent producer anywhere from 15 to 27 home runs on an annual basis — was a better fit for us moving forward," Hill said. "We felt there was value in LoMo — and there’s still a ton of potential there — but we wanted to go with a more proven and consistent player," Hill said. "Once we made that decision, we went to work on trying to find the best fit to help our ballclub, and Carter Capps — you’re talking about a highly coveted arm, something that is not readily available unless you’re giving up talent in return."